Brittany Kummer (Day Hab SS) develops relationships with people in order to build trust. For example, when a new person mentioned living near the ocean, she pulled together information about the ocean to discuss and view together. 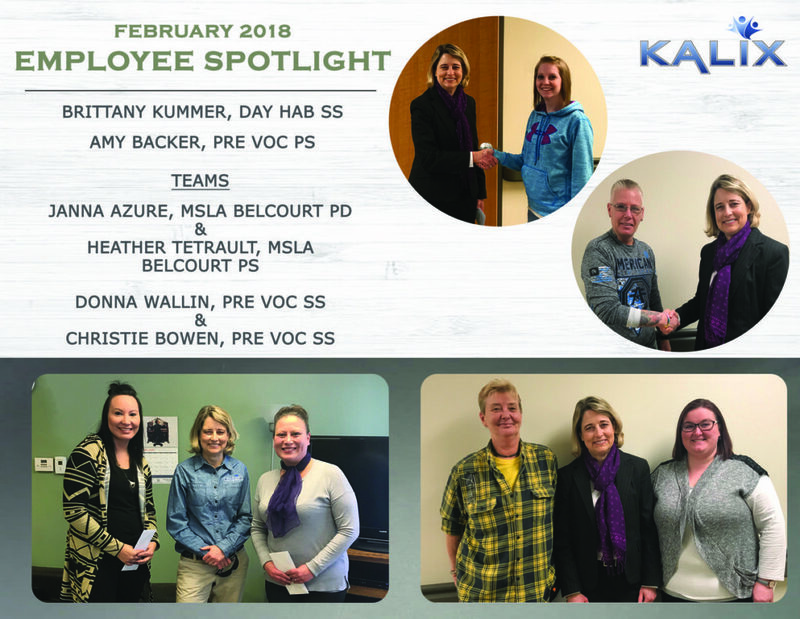 Amy Backer (Pre Voc PS) has worked hard to build teamwork within the PV staff and participants, resulting in increased staff performance and improved attendance from people enrolled in the program. Heather Tetrault (PS, MSLA Belcourt) & Janna Azure (PD, MSLA Belcourt) were nominated as a result of their on-going assistance with a person’s transition to another program. Their ideas and insight are helpful to the person and staff in the new program. Christie Bowen & Donna Wallin (Pre Voc SS) work together to present lessons in general work skills as part of PreVocational Services. They adapt the material to fit people’s needs, interest, and current mood – maximizing learning opportunities and individual progress.